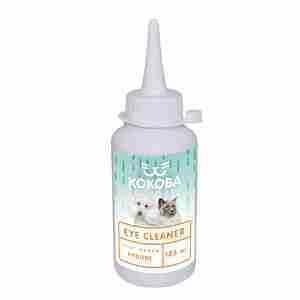 Help reduce gunky build-ups around your cat or dog's eyes with Kokoba eye cleaner. Pets need to have their eyes cleaned once or twice a week, and this eye cleaner are perfect for the job. You can also use them in between cleans if you feel like they need it: flat-faced breeds of dogs and cats have shallower eye sockets, which means more discharge. These are also great if your beloved pal has dry eyes (and doesn't produce their own tears). To use the eye cleaner, hold your pet's head nice and firm and let them relax. Apply the eye cleaner to a clean cloth or cotton pad, gently wipe the cloth or cotton pad to the outer area of the eye and leave to dry. A little mucus is totally normal and healthy, but a lot of gunk can be a sign of conditions like bacterial conjunctivitis. This means you need to be careful, as it can be passed onto humans. If you think your pet might have it, scrub your hands carefully after touching them. Green or yellow discharge means a vet visit. It can be a sign of dry-eye, glaucoma, conjunctivitis, infection or nerve damage so a proper diagnosis is really important. stops sticky eyes and crust from forming. Most animals get a little bit of eye mucus now and then, and if you don't clean it up it can lead to some health issues. It can crust over, making your poor little pal's eyes stick together. Bacteria love mucus, so if left alone it can lead to a nasty eye infection. Use these gentle drops regularly to keep their eyes bright and healthy. It softens up crusty gunk so it's easier to wipe away (without pulling on their hair).